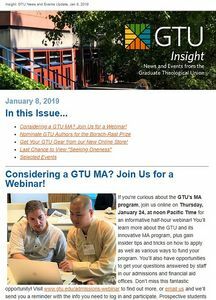 Insight is the e-newsletter of the GTU featuring news, upcoming events, and more. In 2019, the GTU began publishing Insight twice a month during the academic year, usually on the first and third Tuesday. Read our latest issue from April 16, 2019. See below for an archive of past issues.